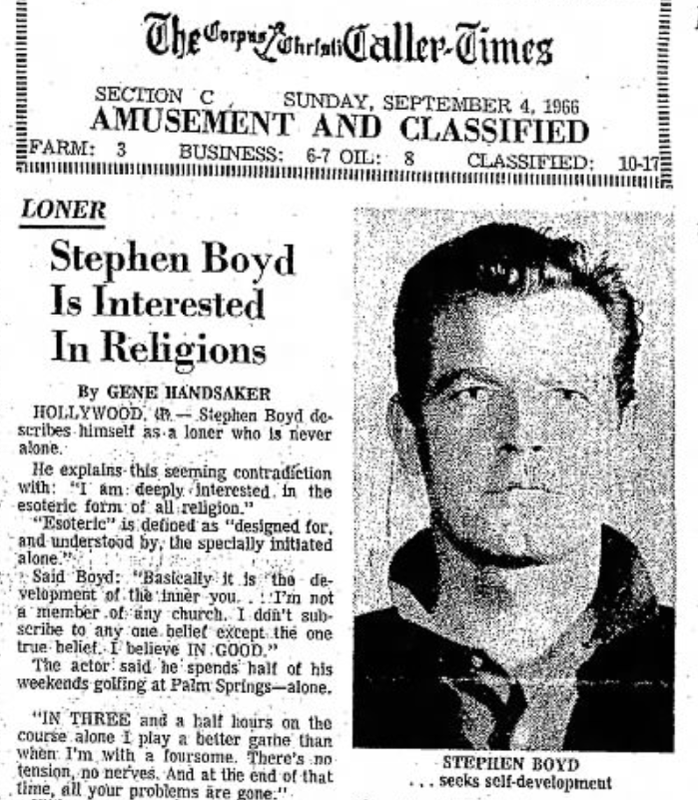 For being a person that valued his individuality, it does seem odd that Stephen Boyd would become so fascinated with a dogmatic, controlling religion like Scientology. But Stephen had been interested in religion since his youth. He had even considered studying theology and becoming a minister when he was growing up in Belfast. “I was sure hard to convince,” says Steve. At the Scottish Presbyterian church he even argued with the Reverend Nicholson about his sermons. “It amazed me.” states Steve, “that a man could read a text from the Bible and then have the nerve to tell others what it meant. Why, it means some- thing different to everyone who reads it!” He’d tell the good man this and they’d have word battles after church, to the preacher’s delight. But later, when Billy Millar briefly thought he’d like to study theology and be a minister himself, Reverend Nicholson shook his head. From an interview in 1966, Boyd expressed his interest in “esoteric” religion. In an interview in August 1969 with the Detroit Free Press, he said that Scientology helped him through the filming of Slaves, and that it is “a process used to make you capable of learning. Scientology is nothing. It means only what you want it to. It is not a church you go to to pray, but a church that you go to to learn. It is no good unless you apply it. It is the application”. Boyd apparently had been elevated to a Scientology Status of OC 6, a position beneath that of Clear. Boyd would actually go on to star and narrate a Scientology recruiting film called Freedom in 1970. A 16 mm copy of this film can be found at the Library of Congress, but it is not available online via any Scientology resource, which may indicate a falling out Boyd had with the Church later on for using his name for recruiting purposes. The film was directed by Richard Franchot and produced by Richard Franchot, Ralph Steckler, Masako Takahashi. L. Ron Hubbard, of course, owns the copyright on the film. It also starred cult actress Karen Black. 1974 Ad for “Freedom” with Stephen Boyd’s name prominently listed. Dolores Hart again mentioned in her memoirs some of her last communication with Boyd concerning Scientology. “(In 1970) he announced his plans to become an active member of the organization (Church of Scientology) and said that his life and mine could never find a crossing point, which saddened me.” This sounds exactly like what happens when Scientologists are called to disconnect from people who are opposed to their beliefs. Is this what happened between Boyd and Hart? It’s hard to track Boyd’s connection to the Church of Scientology past 1970. Did he have a falling out with the Church? Did he continue to be a member? And why was he attracted to the complexities of this dogmatic, cult religion to begin with? It’s impossible to say. It’s just an intriguing mystery about Stephen Boyd which we will never solve. 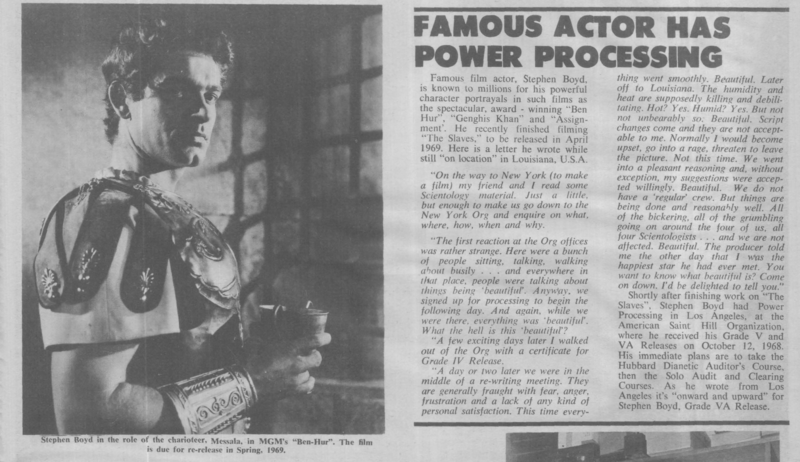 Interesting Stephen Boyd interview below concerning his first encounter with Scientology in New York.